In keeping with the news media's tradition of denigrating and maligning Republican appointees to key White House positions including those related to national security and counter-terrorism, famed military and law enforcement strategist Dr. Sebastian Gorka is being targeted and accused of being Islamophobic without any credible evidence. He's also being labeled anti-Semitic by left-wing Jews who display more hatred for President Donald Trump -- who has Jewish family members -- than for Islamic terrorists such as Hamas and Hezbollah who seek the total annihilation of the Israelis. According to political strategist Michael Baker, a former police official and prosecutor, the majority of news people aren't worried about being seen as biased leftists who believe their primary job is to circulate propaganda and Democratic Party talking points to the unwashed masses. "In an emotional outburst on MSNBC's morning show, co-host Mika Brzezinski declared that it was the job of the news media to 'control' what the American people think. I almost choked on my cocktail. I didn't know whether to be angry with her elitist mind set or happy that she admitted what conservatives have been saying for years," said Baker. Meanwhile, in keeping with Barack Obama mentor Saul "Rules for Radicals" Alinsky's strategy -- "Pick the Target, Freeze It, Personalize It and Polarize It" -- the members of the press began this week to pile on Dr. Gorka with accusations of anti-Semitism, Islamophobia, warmonger, and others. 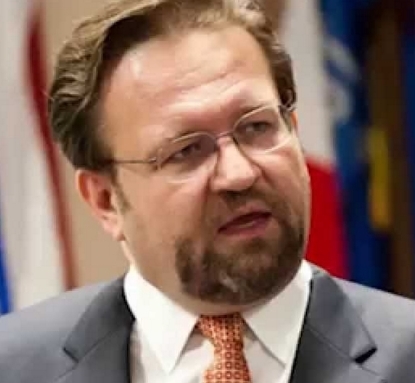 Sebastian Gorka was born in London in 1970 and while attending university he joined the British Territorial Army, serving in the Intelligence Corps, a British counter-terrorism unit specializing in radical Islamic organizations. After returning to Hungary in 1998, Gorka served as an adviser to that nation's Prime Minister Viktor Orbán. At that point he began his work on a doctorate in political science. His doctoral dissertation focused on the strategic differences between the politically motivated terrorism of the Cold War and the religiously motivated terrorists such as Al Qaeda. On Friday, Co-Chair of the Congressional Israel Allies Caucus and the International Religious Freedom Caucus, Congressman Trent Frank, R-Texas, released the following statement in support of Deputy Assistant to President Donald J. Trump Dr. Sebastian Gorka in response to press and social media attacks against him this week: "I have followed the recent press and social media attacks against Dr. Sebastian Gorka and am compelled to respond with disgust at the attempt to libel this American patriot. Most disturbing of all is the attempt to portray Dr. Gorka in any way as anti-Semitic. “Having called upon his expertise on Counterterrorism repeatedly in Congress and used his analysis to inform our work, I can attest that Dr. Gorka is the staunchest friend of Israel and the Jewish people. “He truly understands the existential threat that Global Jihadism poses to both America and Israel and has repeatedly stated that groups like Al Qaeda and ISIS share a totalitarian bond with the Fascists and Nazis who threatened us in the 20th century. To associate him an any way with such ideologies is repugnant and a prime example of what has been termed "Fake News. “Sebastian Gorka's service to the nation, his reputation, and his national security credentials are all unimpeachable and I am thrilled he is now serving in the White House as Deputy Assistant to President Donald J. Trump." Jim Kouri, CPP, is founder and CEO of Kouri Associates, a homeland security, public safety and political consulting firm. He's formerly Fifth Vice-President, now a Board Member of the National Association of Chiefs of Police, a columnist, and a contributor to the nationally syndicated talk-radio program, the Chuck Wilder Show. He's the author of two books: "Crime Talk: Conversations with America's Top Law Enforcement Officers" and "Assume the Position: Police Science for Journalists and Screenwriters." He also serves as political advisor for Emmy and Golden Globe winning actor Michael Moriarty (Law & Order). He holds a bachelor of science in Criminal Justice from Southwest University and SCI Technical School in New York City and completed training at the NYC Police Academy, FBI Continuing Education Program, and the Certified Protection Professional (CPP) of the American Society for Industrial Security. To subscribe to Kouri's newsletter write to COPmagazine@aol.com and write "Subscription" on the subject line.